My panoramic effort of the group shot - click above to see the full effect. "My name is Reza; ID; 'The Styx', S.T.Y.X. ", spelled out my friend before the camera made its way round the ring people to me, "my name is Daveed; ID; D.D.M.M.Y.Y.Y.Y", I added in confusion; wondering if I'd numbered my 'Y's correctly. "You forgot the forward slashes", reminded a fellow member before as we moved on to other members; "...full-stop, colon, 'Saha', colon, full-stop", and then, "...'Thirsty Fish', greater-than sign, equals sign, smaller-than sign, greater-than sign". This tedious introduction was as difficult to relay above as it was to sit through. It was a getting-to-know-you moment for the now regular Flickr photographer's gathering, which in this case, was hosted in a lush public garden in up-town Tehran. I'd first joined Flickr to help extend beyond my words – or vice-versa – just before coming to Iran and was a short time after that that the Iranian Flickr community saw its first gathering. I received an invite to that occasion and politely declined. It was a simple decision for me; the site is forbidden in Iran and in those tender early days, where I'd yet to settle my behaviour and understand the boundaries, it seemed perverse that I should expose myself. 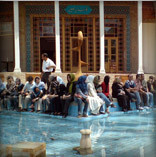 Several gatherings on from this, Flickr hosts – in just one case – a group of over 1000 Iranian (related) users with over 22,000 photographs of which around 30 of those Tehran users joined me for my first experience. For this occasion I was only nervous at the thought of greeting the many new faces, and thankfully not for being carted off by a tipped-off police squad. It only occurred to me upon my first introduction that the game of replacing names with IDs was going to make things a little trickier. "I'm Daveed – 'D.D.M.M.Y.Y.Y.Y'", I repeated, struggling to mouth out this damn alias; this would be followed with a fellow member mouthing out various character combinations in return. It was funny, we were friends; in the virtual sense, I'd been commenting on their work for maybe over a year and now there they were before me; with their wife, child and a grinning face. Americans can only try and have such a smiling group of friendly faces; it was unreal, we were 'virtually' family. We darted around, photographing the garden, photographing each other photographing the garden; some of us photographing the photographers of the photographers. "Go stand over there", one would ask, "sit on in this area", put another as digital clicks and analogue snaps sounded around me. And then there came the traditional group shot. I'd seen many group shots arriving in the Iranian groups, with numbers increasing, associations growing, and now, it was my turn to be another face in the crowd. The nested photographic situation arrived with this moment too, as we arranged ourselves into the photographers and the photographers of the photographers etc. I did both before sitting and smiling; both at making this moment and in the knowledge of being able to follow the follow-on tradition of being able to add a note around my face when the photos were later posted: "Me! It was great meeting you all; I look forward to the next". I'm a British blogger who's very concerned about the West's and in particular the US's and Israel's clamour for war against Iran on the nuclear issue. Let me be clear: I'm not a fan of President Ahmadinejad, whom I believe to be an anti-Semite and a Holocaust-denier. However, such views do not make one a potential mass-murderer. The latter, we are constantly told, must be true because the President has allegedly called for "wiping Israel of the map". There is however considerable debate here in the West regarding whether that statement is actually correct or rather a self-serving Western mistranslation from Farsi. I would like to post a blog post on my blog, using first-hand evidence, that is the viewpoint of actual Iranians and not Western conservative patriots who clearly have motive for the demonisation of President Ahmadinejad and Iran. Please send any information, evidence and links to Gert.Meyers@gmail.com or post them in the comment section of my blog.